This is the first in a series of posts looking at APD crime data. For an overview, including methodology, see Atlanta crime data: project overview. UPDATE: You can view the series of here. The first piece of crime data I wanted to look at was the residential burglaries category. Paulie recently got hit, and I've had a few other friends get hit as well. Burglaries are particularly important when it comes to that nebulous "perception" issue, as well. When someone breaks into our home, we feel personally violated and extremely vulnerable. Even with no one physically hurt, the violence done to our property threatens our physical safety. Could they come back and do that to us? I've seen people completely lose it over a break-in, and it wasn't over the things they lost. 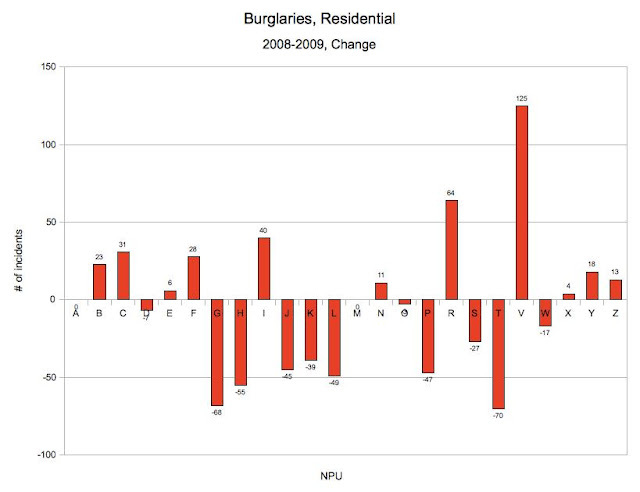 The fact that burglaries are down by 2% so far doesn't negate three years of double-digit increases from 2006-2008. When it comes to residential burglaries, the city gets a big, fat, FAIL. While burglaries are up overall, certain areas of the city have been hit the hardest. Southeast Atlanta neighborhoods have consistently had some of the highest levels of home break-ins, and burglaries have increased significantly in those areas. The biggest explosion in burglaries occurred in 2007 and 2008 in west and southwest Atlanta. You can see that some of the most significant increases in 2007 are in NPUs G, H, I, J, and K, while in 2008 NPUs P, R and S skyrocket. These NPUs are geographically concentrated in the west and southwest of the city. These areas went from relatively low levels of activity (100-150 burglaries per year) to having very high levels of activity (350-500 burglaries per year). NPU J (Dixie Hills, Grove Park, around Simpson Road) has always been bad, but the rest of the NPUs haven't been awful. You can also see that the NPUs most associated with these types of crimes in the media, O and W, aren't doing so hot, either. NPU O, which includes Edgewood and Kirkwood, started off with one of the highest levels in the city before decreasing a bit from 2005-2007. 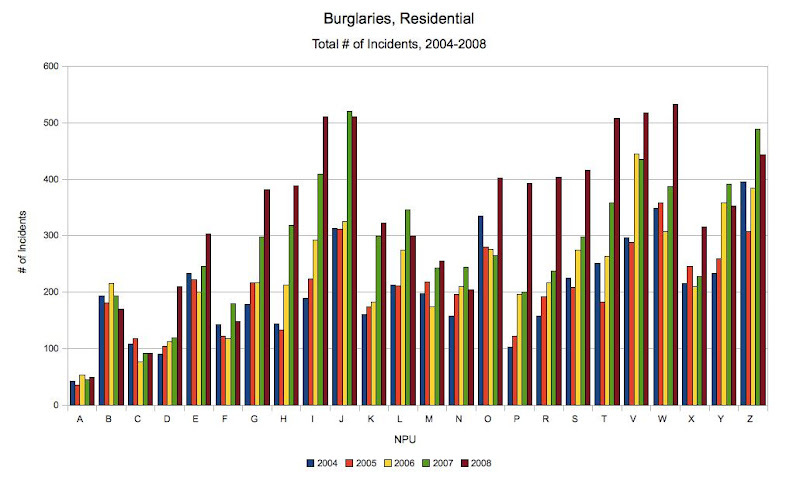 However, 2008 was an awful year for NPU O as the number of burglaries shot up to just over 400. NPU W, which includes Grant Park and East Atlanta, saw moderate increase in 2005 and 2007 before also exploding in 2008. 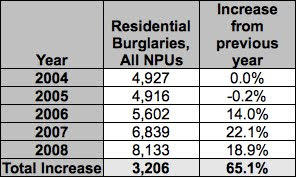 2008 was a bad year for the city as a whole, but particularly bad for NPU W - it brought them in to position as the #1 NPU in the city for residential burglaries for the year. 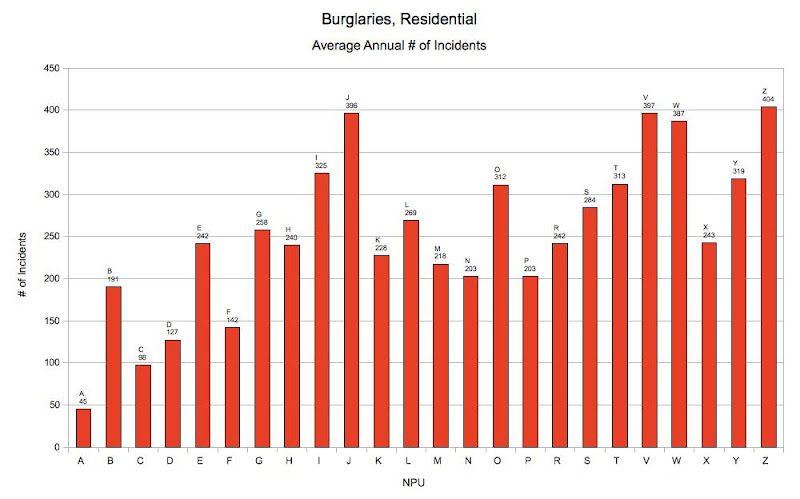 Taking a five-year average for each NPU smoothes out some of the wild variations between years and lets us see which NPUs over the last five years have been the worst for break-ins. This diminishes the rapid growth on the west side, since initial burglary levels there were relatively low. Still, NPUs I and J rank 3rd and 5th overall in average activity. It also highlights just how bad things have been in the southeast. NPUs V, W, and Z rank 2, 4, and 1 overall in average number of incidents, while O and Y are 8th and 6th, respectively. 2009 has been mildly successful, although again we are comparing against a banner year for criminals. So far this year, burglaries are down the most in west-side NPUs. Almost all of the NPUs with decreased level of burglaries are on the west side. NPUs W and O on the east side has seen a slight decrease in activity, but the NPU V has skyrocketed. 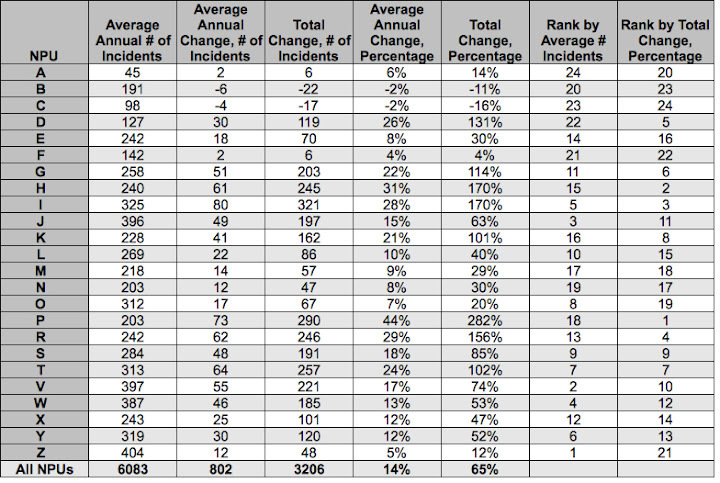 The trends on the west side are hopeful, but "status quo" for the east side means a continued high level of burglaries. If the west side trends continue for the rest of the year, perhaps 2007 and 2008 were just rough years, as opposed to indications of a permanent increase. The same cannot be said for the southeast. Below is a summary of numerous statistics referenced in this post, as well as annual averages for the increases for each NPU. * Caveats about the data that I've found -- for example, many times North Ave gets entered in as "Nort Ave" in the free-text address line, but then there are separate "Street" and "Type" columns that area apparently drop-down menus for data entry, so it gets properly recorded as "North" and "Ave." I can only surmise from the state of this data that the APD doesn't exactly have state-of-the-art data management. It can be extremely frustrating to look at this data. I have no idea when I'll be able to provide these things, I'm just saying I'm willing to, as this project goes on. One graph per NPU per major crime category. Quarterly buckets, with a 1 year rolling average trend line. Nice job putting this info together. It is very much appreciated. Now I know what Pennington and Franklin mean when they say crime is down. Thanks for putting this together, even if it does depress me a bit. Thank you for providing this data. I have property in west Atlanta and I've had so many incidents in 2008, that I just stopped reporting in 2009 sometimes because it wasn't worth my time to wait for the police to show up, if thy showed up. This could be contributing to the downward/flattening trend in 2009. My experience is that crime is still up, I just don't report it all the time anymore.